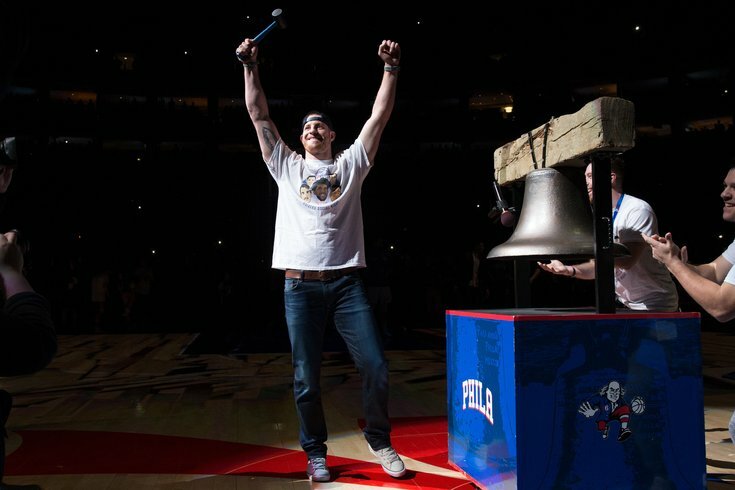 Philadelphia Eagles quarterback Carson Wentz raises his arms after ringing the ceremonial liberty bell before Saturday's game between the Philadelphia 76ers and the Orlando Magic. Three weeks after the Super Bowl, the Eagles just keep winning and winning and winning. It is no coincidence that our winter pro teams have emulated the NFL champions since that desperation throw by Tom Brady bounced off the turf in Minnesota. Suddenly, Philadelphia is a city of winners. It's real, Eagles fans, and it's spectacular! The 76ers and Flyers are on streaks of success right now unlike anything these two mediocre franchises have experienced in years. Even after their loss in Washington on Sunday night, the Sixers are 7-1 since that magical date of Feb. 4, and the Flyers are 9-0-1 in that span. Combined, the two teams are 16-1-1 over the past 22 days. “There’s definitely a correlation,” coach Brett Brown of the Sixers said on my WIP radio show last Friday. “I don’t think it’s a coincidence,” said Flyers captain Claude Giroux on Thursday night. Not everybody agrees with this theory, however. The curmudgeons — all of whom, by the way, gave the Eagles no chance a few months ago — insist that the fortunes of one team have no bearing on any other. There’s a word for these people: clueless. As someone who talks to the fans on a daily basis, I can say with conviction that the improbable Eagles’ win over New England and the parade that followed changed the lives of everyone in and around Philadelphia. There is no way to avoid the optimism and confidence that the Eagles gave to all of us. For example, people who never called a radio show before are talking about how they shared the joy with their children, sealing another generation of Eagles fans. Many, many weddings and funerals have adopted a green-and-silver theme. Although there are no statistics, the rumor is that people are even having more success in singles bars. According to a psychologist who called in last week, there’s nothing all that unusual about this phenomenon. If nothing else, it proves how mental our sports can be, especially at the professional level. Since the Flyers went through a 10-game winless streak last fall, they have not just changed their game; they’ve changed their mindset. Confidence breeds success, and success breeds more confidence. Every one of the players on the two winter teams saw what the reward is for the ultimate achievement, and now it is more than a fantasy. What awaits them, if they can do it, is a city’s undying affection. That have seen that now, up close. Earlier last week, Dave Schultz showed up at a remote WIP broadcast and eagerly recalled the first big Philadelphia sports parade in 1974, when fans spilled out onto Broad Street and greeted their heroes, who were in open-top vehicles, with handshakes and hugs. He said the feeling never really left. While he was speaking, a fan stood behind him wearing a crisp, new Dave Schultz jersey, 44 years after the Hammer brought the first Stanley Cup here. Of course, there’s one other pro-sports team in our city, the Phillies, and it’s too early to determine if the positive aura can lift them out of the 96-loss hole they dug last season. What we already know for sure is that they’re trying. New manager Gabe Kapler invited parade hero Jason Kelce to address the young roster last week before the first full practice of spring training. The word is, Kelce didn’t bark out all the names on the Phillies roster and scream out why each is disrespected, but he did pound the same basic theme. If any team is an underdog in our city, it’s the Phils. After the session, Kapler — an eternal optimist — said no goal was too ambitious for his ball club because of what the Eagles just did. He’s right. Anything seems possible now. For our teams, and for ourselves. Howie Roseman is about to become a much less popular guy around here. The Eagles’ vice president of player personnel has no choice but to part ways with at least a handful of the beloved players on the 2017 team. And make no mistake. Fans will bristle at even the lesser names on the list. Since the knee injury involved more than just the ACL, Dr. Kelly said the surgical reconstruction figured to take at least nine months to rehab, and maybe even closer to 11. That would mean the Eagles would be without their franchise quarterback for, roughly, half the season. If so, the Eagles should not trade Foles, despite the $5.2-million relief on the salary cap. But it does mean other really rough departures are inevitable. And the exit line must begin with Jason Peters, the 36-year-old left tackle who will make $10.7 million next season and is a luxury the Birds can no longer afford. He has become far too prone to injury, and Halapoulivaati Vaitai proved to to be an admirable replacement, with room for improvement. Also too expensive, despite a solid year, is Vinny Curry, one of Roseman’s rare mistakes since returning to his GM duties. Curry had one of his best seasons in 2017, but he still isn’t worth the $47-million contract Roseman gave him two years ago. The emergence of top pick Derek Barnett makes Curry a potential trade chip, if not an outright release. The biggest contract issue this off-season will be the other starting defensive end, Brandon Graham, whose strip of Tom Brady late in the Super Bowl sealed the victory. He needs a restructured deal that will move some of the 2018 money into future years. Above all, he must stay — for many obvious reasons. There are other candidates for departure, like it or not — aging tight end Brent Celek and disappointing wide receiver Torrey Smith, for sure; probably linebacker Michael Kendricks, maybe even punter Donnie Jones — because Roseman will need money to reinforce the best team in football. None of these cuts or trades will be popular because of what the players all accomplished, but the backlash against Roseman will be brief and small because he is a hero, too. After the remarkable rebuild he just achieved, no one can doubt him, at least right now. Where they realize it yet or now, Andy MacPhail and Matt Klentak do not have as much time to rebuild the Phillies as they think they have. At least that was my reaction after the most public week ever for Phillies owner John Middleton. Not a patient man by nature, Middleton did a series of interviews last week that revealed a man who is tired of failure after six straight non-winning seasons. Middleton didn’t become a billionaire while sitting around and waiting for lackadaisical executives like president MacPhail and GM Klentak to produce success. The most revealing comment — confirmed by both sides — came when Middleton said he checks with Klentak several times every day to see if there’s any progress on acquiring a free agent or making a trade. Based on how little Klentak has actually done — other than signing Carlos Santana, what? — the answer has usually been no. During an interview with NBC Sport Philadelphia’s John Clark, Middleton sounded determined to add a big name before the start of this season, most likely ace starter Jake Arietta, a free agent who would love a five or six-year contract. Klentak is balking at anything over three, and he’s probably right. At 32, Arrieta is getting older, not better. But something has to get the process moving, and soon. In an Internet poll we conducted last week at WIP, 62 percent of the fans said they thought the Phillies rebuild was taking too long. I can’t prove it, but I’ll bet John Middleton is part of that 62 percent. • As if we needed more proof that the Eagles are a special team, Alshon Jeffrey revealed last week that he played most of the 2017 season with a torn rotator cuff in his right shoulder. Remember that difficult catch he made in the back of the end zone in the Super Bowl? He reached up with a seriously-injured arm and snatched it away from ex-Eagle Eric Rowe. Pitchers need 18 months to recover from a rotator-cuff tear. Alshon Jeffrey won a Super Bowl with one. Amazing. • It’s weird to say, but the best thing that happened to the Flyers last week was the injury to goalie Michal Neuvirth. First of all, it proved Neuvirth is just too brittle to count on anymore. And second, it forced GM Ron Hextall to acquire Petr Mrazek from Detroit as a more reliable backup when starter Brian Elliott returns. The Flyers are deeper than ever at goaltender now, and not necessarily by design. • For reasons previously discussed, I am no fan of the Olympic Games, but even I have to acknowledge the fabulous upset of Team Canada by the feisty U.S. womens’ hockey team. Am I the only who who watched Jocelyne Lamoureux-Davidson score the winning goal and wondered why no Flyers player has such a great shootout move? Bravo to her, and to a bunch of young women who refused to lose. • Mark Cuban has been a pompous blowhard for a long time now, and it’s going to be a lot harder to tolerate his bluster after the week he just had. The NBA fined the owner $600,000 for saying it was best for his terrible Davis Mavericks to tank for the rest of the season, and then he acknowledged retaining team president Terdema Ussery despite several allegations of sexual harassment. Ussery is gone now, and so is whatever was left of Cuban’s reputation. • Eagles coach Doug Pederson loves ice cream, but it wasn’t until last week that we learned he prefers vanilla with strawberries, whipped cream and sprinkles. OK, that’s it. I’m pretty sure we’ve got all of our post-Super Bowl questions answered now.